The ceremonial absurdity, endless repetition of lines, and deference to an eccentric Creator-figure: protagonist Prendick’s introduction to the laws of Dr. Moreau’s titular island (quoted from H.G. Wells’ original novel) could also describe life on a movie set – and that’s on a good day. 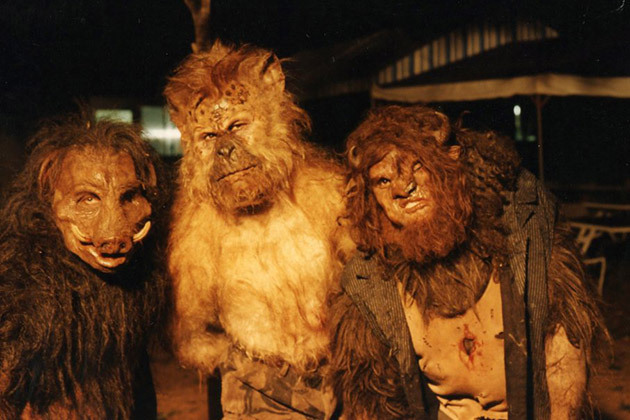 A production as legendarily troubled as the 1996 Island of Dr. Moreau adaptation – chronicled in the documentary Lost Soul – naturally invites various creation-gone-wrong metaphors, bolstered by the story’s subject matter of an exiled Victorian vivisectionist’s somewhat ill-advised dream to splice together man and beast. As a ready-made mix of frustrated vision and unfortunate irony, Soul had the best starting platform Terry Gilliam’s failed Don Quixote movie became Lost in La Mancha (2002). As a film, the documentary is technically unadventurous, but the story it tells is an amazingly entertaining and insightful trip through a series of highly questionable decisions. Visually the film is mostly talking heads. While Jodorwosky’s Dune (2014) used animations to bring a semblance of an un-filmed movie to life, Lost Soul: The Doomed Journey of Richard Stanley’s Island of Dr. Moreau sparingly uses archival concept art, new animation, and even clips from the finished Dr. Moreau movie. This is a particular shame because the fragments shown from the Movie that Was are awkwardly bizarre, and the Movie that Could Have Been intriguingly so. Yet – visual lackluster aside – Soul tells a more complex and ambiguous story than Dune, which romanticizes Jodorwosky’s unfulfilled vision while avoiding the minutia of how and why it collapsed. Lost Soul is all about the how, with the film’s briskly-paced audio driving its energy. The overall cinematic experience is of listening to a crazy, crazy pub tale. The gist: Richard Stanley was a young horror director who had minor commercial and critical successes with Hardware (1990) and Dust Devil (1992). Looking to move up to slightly higher budgets, he had high interest in adapting The Island of Dr. Moreau. New Line Cinema greenlighted his project, then decided it was also looking to up its ambitions, choosing their little island-of-unspeakable-horrors flick to became a higher-dollar, semi-prestigious real movie-like movie. New Line banked on two famously unstable actors to sell tickets: Val Kilmer and Marlon Brando. After a series of misfortunes and clashes with Kilmer, three days into production Stanley was out. Moreau’s cast and crew discuss Stanley’s replacement, the aging John Frankenheimer, as one of the last directors of the ‘yell at everyone a lot’ school, an experienced hand who the producers hoped could corral their production’s difficult leads. Personally un-invested in the material, his prime directive was to finish the damn movie. Kilmer remained combative to pretty much everyone behind the scenes. Brando became an agent of chaos within the frame, making ridiculous demands for his own amusement. He insisted his version of Dr. Moreau should spend a scene covered in what’s described as ‘zinc oxide and …cheesecloth’, and that the climactic monster revolt have the atmosphere of a “bar mitzvah.” Co-star Fairuza Balk recounts how when she asked Brando how their characters should relate, he waved her off by saying that ‘no one’s going to care about the movie except for this guy’, referring to Nelson de la Rosa, the world’s shortest man (2 feet 4 inches tall), who at Brando’s insistence was promoted from the background to Moreau’s ever-present side-kick. The various oddities hired to play the island’s various oddities treated the shoot as an endless party. Eventually, they found Stanley deep in the jungle, raving about how Val Kilmer ruined his life. The troupe gave him a pig-man mask and invited him back to the set, where he acted clandestinely as an extra. From these circumstances, a movie was made. While his unfulfilled vision sounds fascinating, the extant Moreau that Lost Soul documents is effectively an ensemble tale of Hollywood’s hierarchies, amplified to near parodic proportions. Name actors like Brando and Kilmer – despite their known toxicity – could be as unprofessional as they liked, because New Line needed them more than they needed it. After his ideas set a production in motion, the young idea-man Stanley was expendable as a director. 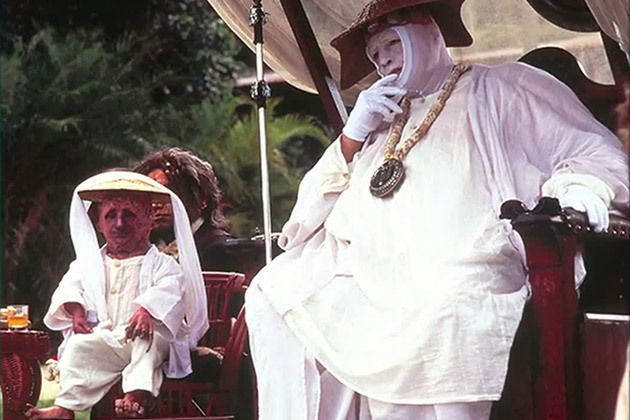 In these senses the connections between Moreau and Moreau run deeper than the interplay between authority, questionable decisions, and compromise that could be observed in most any movie. Both are fascinatingly grotesque stories of creative agents testing their social and natural remits and the eventual triumph of their assemblage’s chaotic nature. A Richard Stanley Moreau movie remains something I hope to someday see. The documentary’s producer (who attended the screening I saw) suggested that he may get another chance, bolstered by Soul’s buzz and the original book’s public domain status. For that matter, Amazon is encouraging Terry Gilliam to take another crack at The Man who Killed Don Quixote. While both of these hypothetical films would likely be more technically impressive than Lost Soul, they are unlikely to top the transfixing insanity of the tale it tells.